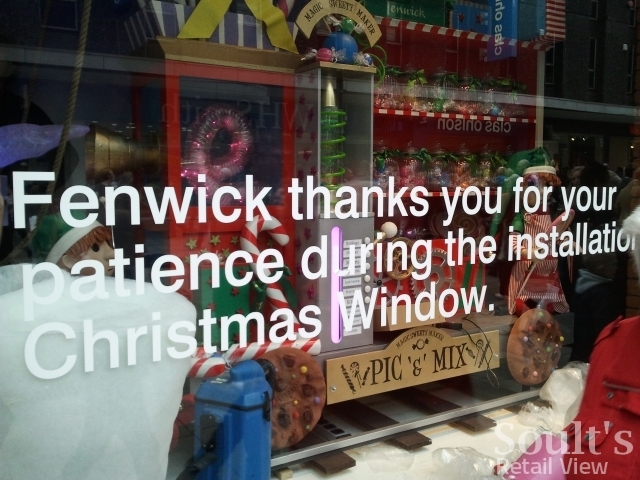 Newcastle’s iconic Fenwick department store is rightly known for its annual Christmas window – which can’t, scarily, be very far off making its appearance for 2013. Last year I captured the Christmas window being set up on 30 October (below), so on that basis we can expect to see festive activity kicking off in Northumberland Street in just a week’s time. 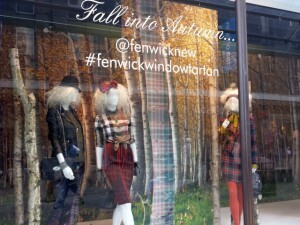 In the meantime, however, Fenwick’s current ‘Fall Into Autumn’ window offers much to enjoy. Divided up into a series of distinct themes, each section of the window uses elegant white mannequins to showcase outfits from the department store’s ladies’ fashion ranges. 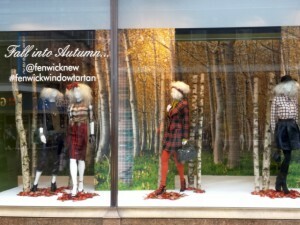 Behind the models, a colourful wooded backdrop unifies the window as a whole, complemented by props – in the form of real trees and piles of leaves – that help to create the illusion of the window being an outdoor space. These props, and the clever staggering of the backdrop, convey a real sense of height and depth, adding to the interest and effectiveness of the composition. However, there’s no doubt that it’s the bold and colourful fashions and accessories that really stand out, while the props do exactly as they’re supposed to: building the scene, but never distracting from the product. The minimal point of sale in the window is also interesting. 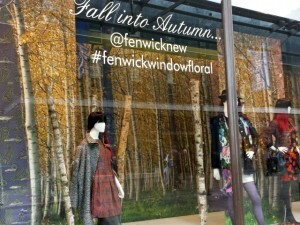 Adding to the feel of the window being a genuine autumnal scene, there are no discernible product details or prices shown, the idea presumably being that potential customers will be sufficiently engaged by the window to venture into the store. 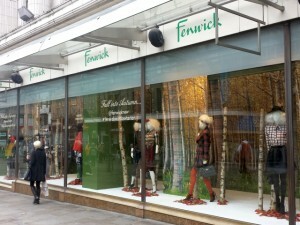 Evidently, the window is as much about communicating the Fenwick brand – as fashionable, relevant and creative – as it is about selling the product. Indeed, what messaging there is is limited to just a few words on the inside of the window: the ‘Fall Into Autumn…’ headline in a script typeface, with the Fenwick Newcastle Twitter address (@fenwicknew) underneath. 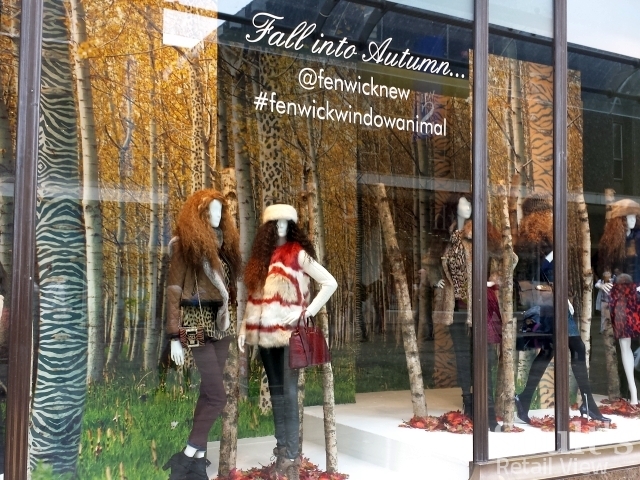 Finally, each section of the window has its own hashtag – #fenwickwindowanimal, #fenwickwindowfloral, #fenwickwindowtartan, and so on. 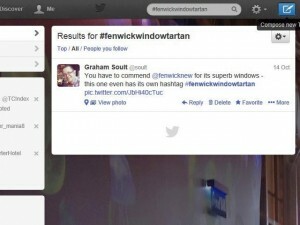 It’s a neat attempt to build a buzz and interest around the window on social media – while, again, conveying Fenwick as a modern retailer – though in reality the only person who seems to have engaged with the hashtags on Twitter is me. 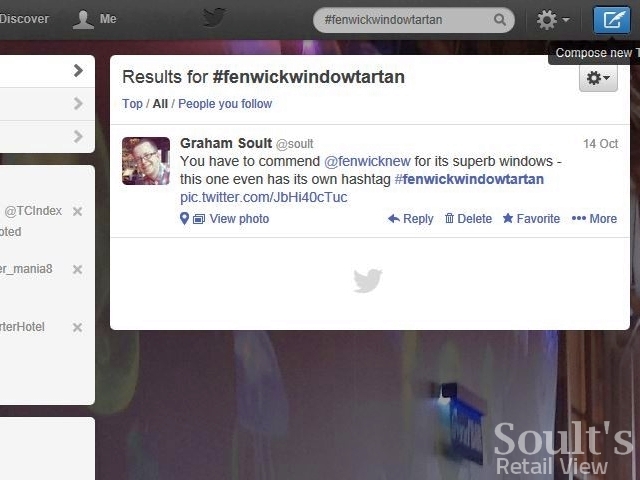 It’s a cue, perhaps, for Fenwick to be a bit more proactive next time in promoting its own window and hashtags, which, ironically, don’t seem to have featured in any of its own tweets, or, indeed, on its popular Facebook page. 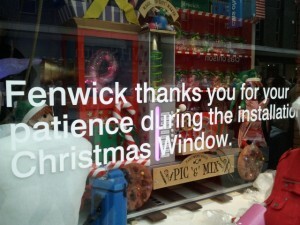 Surely Fenwick could have posted photographs of its own window for its followers and fans to admire and share? Furthermore, while Fenwick Newcastle’s Twitter account did favourite the tweet that I wrote praising the window, not retweeting it seems like a missed opportunity to make its 7,000+ followers more aware of the Fall into Autumn campaign. 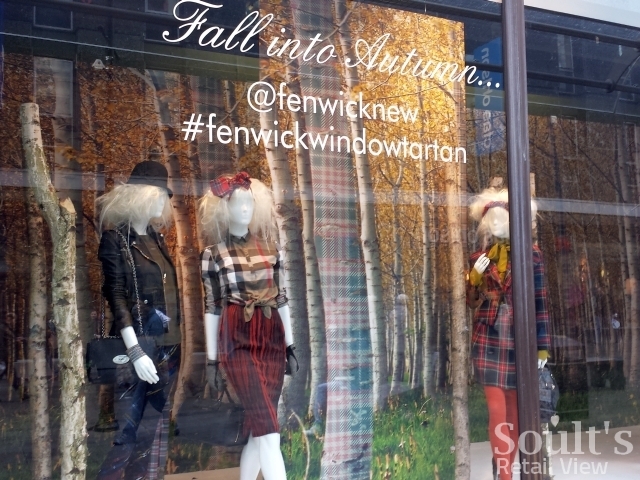 So, top marks for the bold and gorgeous window – which is undoubtedly one of the best in the city just now – but a pity that it hasn’t been more joined up with the store’s social media marketing. 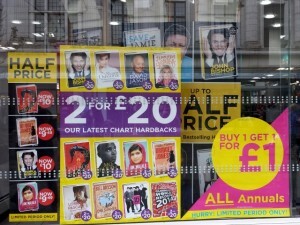 Directly across the street from Fenwick, WHSmith’s attempt at window dressing is somewhat less successful. 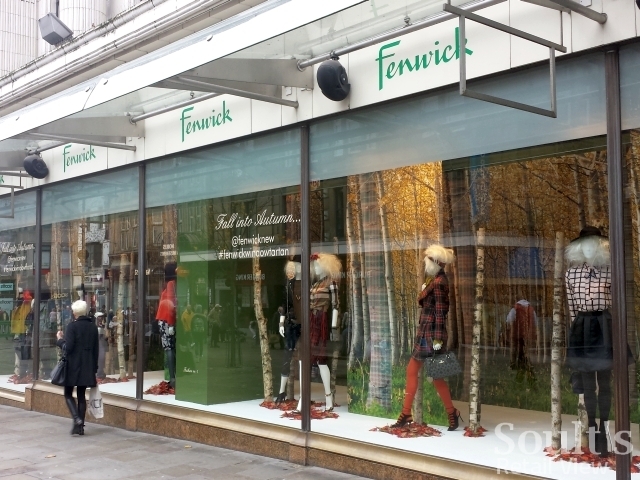 Admittedly, it’s always going be easier to create an eyecatching display from fashion product than it is from books, pens or Kobo e-readers; equally the WHSmith window, while a good size, doesn’t offer quite the same potential as the Fenwick one. 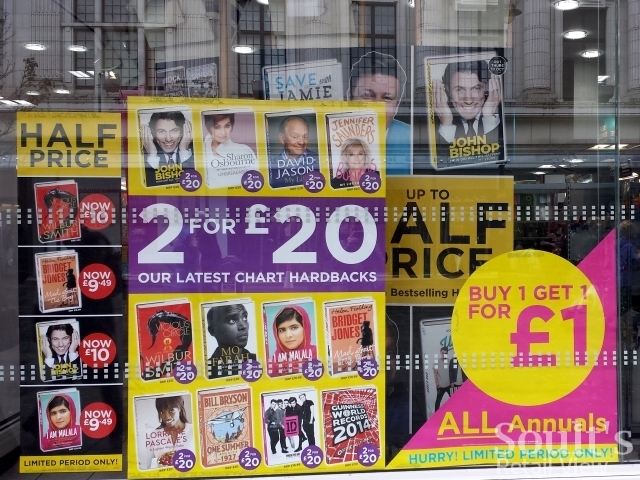 Even so, WHSmith’s failure to do anything interesting with its shop window, either here or at its other stores, is such a disappointment. There’s no attempt to showcase any actual product, relying instead on a cacophony of posters that shout a predominantly value message. Inexplicably, these are layered over the top of each other, so that the point of sale on the inside of the window obscures that positioned behind it – a move that makes no sense at all. Frankly, it’s all rather a mess, with so much going on – and with no rhythm or order – that you just tune out completely. Shoppers are more likely to notice (and dodge) the Red Cross chuggers camped out in WHSmith’s entrance than have their interest piqued by anything in the window. WHSmith’s boss, Stephen Clarke, recently claimed that the business had spent £12 million last year revamping existing stores, and defended his chain from accusations that some stores looked like “1970s Jobcentres”. 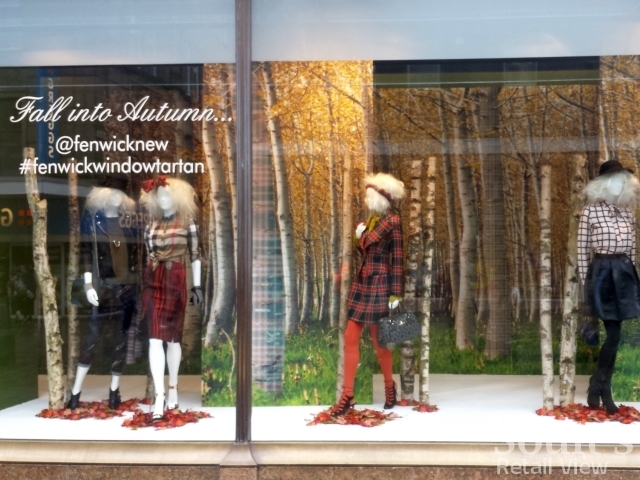 If WHSmith is looking to address those negative perceptions, it certainly wouldn’t hurt to begin by recruiting someone with Fenwick’s flair and creativity for window dressing. My retail consultancy business, CannyInsights.com, works with retailers to improve the impact of their merchandising and social media marketing. For more information on how CannyInsights.com can support your business, visit www.cannyinsights.com, drop me an email, or give me a call on (0191) 461 0361. 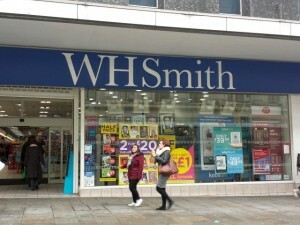 I totally agree with your comments about WH Smith. The window looks tatty and easy to ignore. The store could do with a bit of a make over. The carpets are well worn in some places and the external signage no longer illuminates. Just little things here and there to spruce it up and make it look less tired. Woolworths to make a high street return?